This economically priced knob is the perfect accessory to create a modern, comfortable atmosphere in any room in your home. 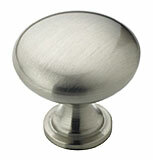 The Amerock satin nickel finish works well with any furniture or cabinet designs and brings out the fine design of this knob. Note: This product is also known as BP53005G10, AME-103129, AMBP53005G10 on other websites.